Considered to be one of the top three festivals in all of Kyoto despite its status as a relatively new tradition, Heian Shrine's Jidai Matsuri (Festival of the Ages) is held on October 22nd from noon each year. 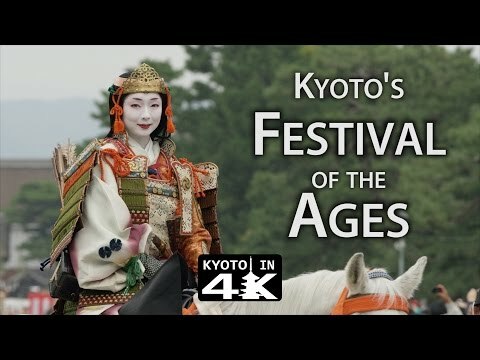 The festival is primarily composed of a two kilometer, five hour long procession of countless volunteers dressed in historical garb representing Japanese cultural history from the Meiji era all the way back to the Enryaku era in the 780?s. Painstakingly recreated and researched, going so far as to even make and dye the fabric using the same techniques as they used a thousand years ago, the procession is akin to watching a living history museum march by. Not only do famous historical figures and princesses make appearance, but warriors, priests, politicians, merchants, and commoners are all represented. With that many characters, the Jidai Matsuri gives a very comprehensive look in to the clothing and appearance of Japanese past.